T-Mo USA Getting the BlackBerry Curve 8900 this February? I'm not sure what's going on in the world of BlackBerry, but it seems the good 'ole US of A has (mainly) been getting the short end of the stick as of late in terms of getting new BlackBerry smartpones first. The BlackBerry Bold was released pretty much everywhere in the world this past summer, yet AT&T didn't get it until November, the Storm hit Vodafone a week before Verizon (not too big of a wait - won't complain on that one) and now Americans are left waiting yet again, this time for the BlackBerry Curve 8900. 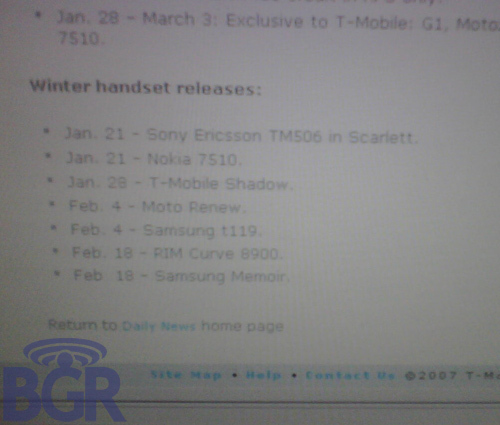 I've had my Rogers BlackBerry Curve 8900 for a couple weeks now and am LOVING IT, so I was glad to see this T-Mobile roadmap get leaked yesterday which calls for a mid-February release of RIM's next generation Curve. This is one of those devices that just needs to be out there asap! Release dates such as these have a habit of changing, but the good news is that February 18th isn't that far off. Half of the fun of buying a new smartphone is the anticipation, so hopefully those of you have been waiting for this one will make the most of the next six weeks of agony. Now we just need to know when AT&T is getting this baby... don't be surprised if you see them release it prior to T-Mobile.